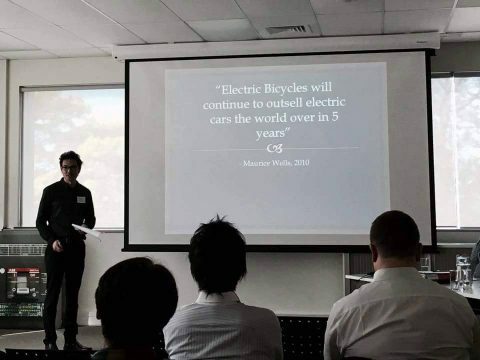 Electric Bike team was started by… me, Maurice Wells. A Kiwi/Aussie dual citizen, I became part of the net migration (always the trend-setter) back to NZ when my partner Kaitlin was offered a position at the University of Auckland. Over we came from Sydney with our then 10-month old Oskar in the winter of 2015! I had been involved in the Sydney cycling community for many years where amongst other things I helped to get a community Bike Club up and running. I studied Solar Energy engineering at UNSW where I started the UNSW Bike Club. I first met electric bicycles around this time and saw a huge potential to get more people onto two wheels with this technology. I went on to write my graduating thesis on electric bicycles and battery design and left UNSW with first class honours in 2007 (the e-bike went to my mum!). From there it was into the solar industry by starting the Sydney Energy Cooperative. 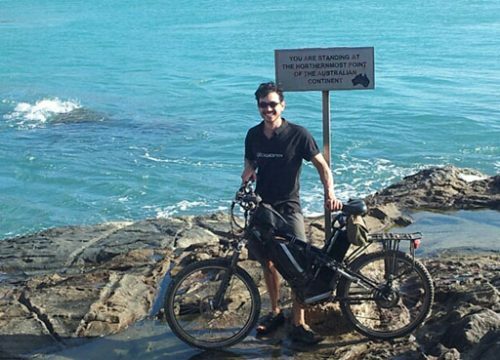 I kept working on electric bicycles as a hobby and finally took the plunge in 2009 with the goal of bringing the world’s best electric bicycles to Sydney and Australia. That became Glow Worm Bicycles, Australia’s coolest, most innovative and community-focused electric bicycle store! Glow Worm Bicycles is still going strong thanks to our amazing staff and customers and new part owner Alison Cheong. 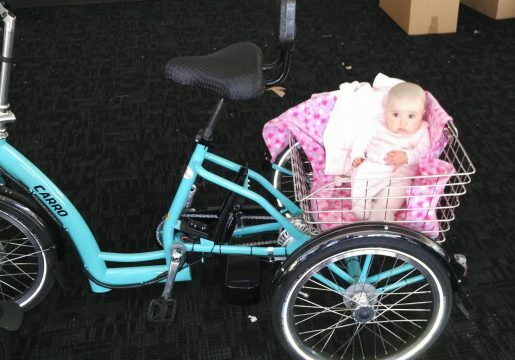 Glow Worm Bicycles has been the importer and distributor of eZee electric bicycles throughout Australia since 2010 and had plenty of opportunities to work constructively with then NZ distributor, Jace Hobbs, of Electric Bike Hub in Nelson. Somewhere along the way we found time to open another store, Omafiets Dutch Bicycles, focusing on urban bikes and it’s doing great things for everyday riders, including providing Brompton folding bicycles and Vivente World Randonneur touring bicycles to the people of Sydney! When we arrived in Auckland, Jace from the Electric Bike Hub in Nelson immediately put me to good use, working from the garage at home in Orakei, demonstrating eZee e-bikes to customers, assembling, delivering and servicing a fleet of eZee Sprint 7L e-bikes to NZTA and then Auckland Council. I was impressed with how fast Auckland cycle ways were being improved and built, riding daily on my eZee Sprint or Gazelle Cabby with eZee conversion kit. In early 2016 I found a fantastic spot for a shop, right along the new Te Ara i Whiti (pink light path) and at the junction of all the safe, car-free cycle paths going in and out of Auckland city. We co-branded it Electric Bicycle Hub Auckland in cooperation with Electric Bike Hub in Nelson. And what a shop it is – like no other Auckland has seen, with a huge range of fantastic electric bicycles, folding bicycles, cargo bicycles, everyday riding accessories, beautiful bags and baskets, commercial services and so much more! I’m so excited about the potential for Auckland to become an even more awesome city with new safe cycle paths and awesome electric bikes, starting right now! By 2018 we had re-branded as Electric Bike Team and become the national distributor of eZee electric bicycles throughout New Zealand, building on from the past work of Jace Hobbs to spread these fantastic electric bicycles even further. Emilio hails from Mendoza, Argentina and is in charge of our corporate and commercial services, managing e-bike fleets from start to finish. 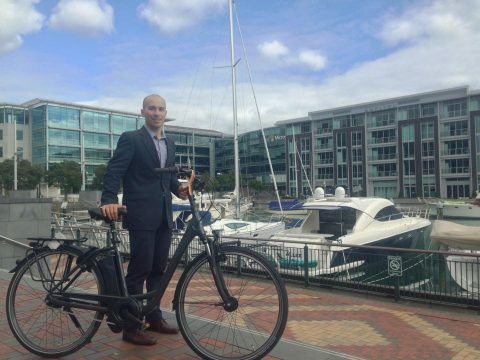 He and his wife Maria original travelled to Auckland so that he could write a Masters thesis comparing bicycle infrastructure programs in Auckland, Buenos Aires and Copenhagen. It’s our good luck that they decided to stay on here. Emilio is a wealth of knowledge on all types of bicycles and of course how to happily and safely use them for everyday purposes in Auckland. Emilio rides an eZee Sprint into the shop from Parnell, as well as everywhere else he needs to go. He has a lot of experience riding in Auckland and will be happy to help you find the best route for you.